When you launch a content marketing campaign, your aim is to rank at the top of search results. But earning a proprietary spot doesn’t just mean creating more and better web content than your direct competitors – it means vying for the same search positions as well-known publishers. Ranking alongside household names is ambitious, but it’s possible when you create high-quality content that offers clear value to readers. A company in the financial staffing industry worked with our editorial team to develop an original and educational online resource center, and in turn saw how content can fuel top-ranking search strategies. 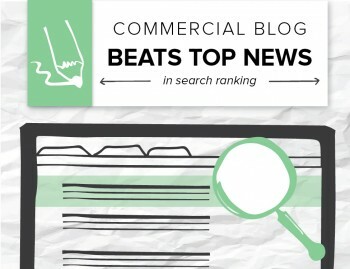 After discerning the best topics and ideal voice, our team reported that the blogs were consistently ranking (highly) in Google search results. One of the site’s particularly successful blog posts clearly addressed the search terms job seekers use to look for employment information. The result? 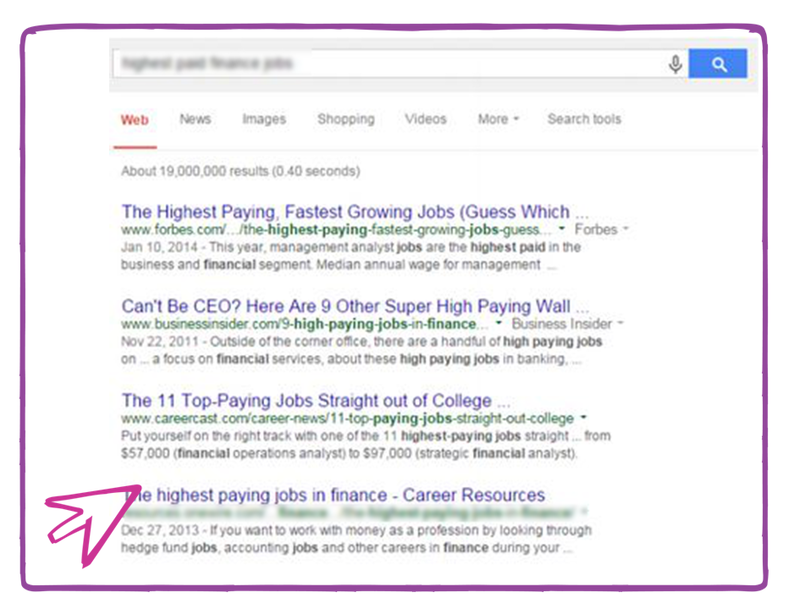 It ranked well above the fold on Page One – just behind top publishers (like Forbes) for a valuable long-tail keyword. Why was this article so successful? According to the client’s editorial team, brand awareness played a key role. This company strives to convey a fresh perspective that it knows will attract its ideal audience – young urban jobs seekers. An important factor in this client’s blog strategy is the balance it strikes between timely, news-driven articles and timeless pieces that answer recurring customer questions. In doing so, the company’s content was more than a dry corporate blog OR a news center. It turned the site into a resource center that’s rich in information prospects and customers want. The high-ranking piece that drove all the clicks and impressions would fall into the latter category, as it answered a broad questions about the highest paying jobs in the financial services industry. This piece continued to get search traffic – and drive results – long after it had first been published. At the same time, the company continues to publish articles that reflected timely trends. To kick off the New Year, the client asked its content writers to produce a series that recapped trends from the past year and covered projections for the coming 12 months. There’s no cure-all for SEO and content marketing. There isn’t one winning strategy that will guarantee companies a top search rank, let alone a place alongside well-known publishers. Editorial instinct, a deep understanding of customers’ needs and SEO savvy are three factors that need to come together for marketing content to earn a spot in SERPs.